The guys from Discover Tenkara are back this month with an in depth look at the history of Tenkara. Another great read! There is, we feel, an important duty on all new tenkara anglers to get at least a basic appreciation of its background and traditions. Of course it is perfectly valid to pick up a tenkara rod and use it in just the same way as you would any other “conventional” fly fishing rig. Equally, it is good to experiment and push the boundaries of how tenkara tackle could be used. In both cases, though, you can run the risk of simply re-inventing a poor-man’s version of an existing wheel that Japanese masters have already elevated to a fine art. Furthermore, you might well totally miss out on some fascinating and very effective skills honed over many centuries before we came along. It is always desirable to get a good grounding in what the existing skills and conventions are – so that we understand when our own activities depart from those conventions. That also helps to flag up occasions when new definitions and categories need to be created so that everyone has a sensible idea what we are actually talking about! Now, we are absolutely sure that both John and myself will at some point make a naive statement that could cause an old Japanese tenkara master to snigger into their sleeve. However, as long as someone can point that out to us and we learn something in the process, then we take that as a positive. We go to great efforts to make good honest mistakes in our research– rather than just assuming that what we are doing is the “be all and end all” of tenkara. 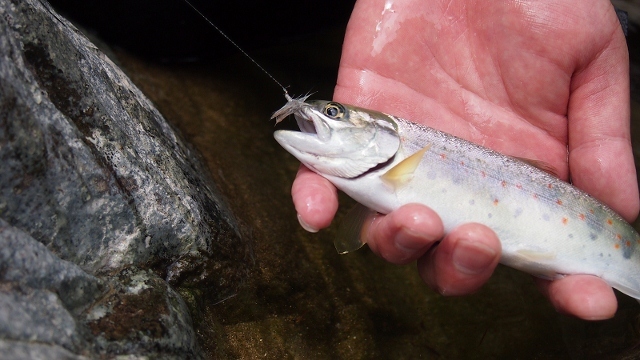 In our experience, this is the greatest pitfall for people in the west who say things like “Yeah, tenkara is alright for a bit of an alternative to real fishing”, “you can only land small fish on a tenkara rod” or “tenkara is no more than pole fishing” – thereby dismissing an entire pool of knowledge that they remain totally unaware of! The earliest written records of tenkara are thought to appear in either 1877 or 1878 (more on which later). Realistically, these dates are likely to be misleading in terms of the genuine origin of tenkara. Variations on this style of fly fishing on mountain streams in Japan were probably going on for centuries (just like similar methods elsewhere in the world from 700 AD onwards). Unfortunately, there was nobody in the Japanese mountains who could write about it! The original practitioners were peasants with no knowledge of reading or writing – but who developed an efficient means of catching fish in steep, shallow and boulder-strewn streams to feed themselves and to sell on to others. Fascinatingly, the restrictions facing those subsistence anglers turned out to be the very driving forces that eventually lead to recognisable cornerstones of modern “sport” tenkara ethos. For example, the precious nature of tippet material (as well as equally precious time and material required to tie flies) meant that multiple changes or losses of flies on the stream bed could be financially disastrous. Consequently, developing “generic” suggestive patterns that could be manipulated to meet a variety of imitative needs was a neat solution. Similarly, developing tricks to attract the attention of a deep-lying fish and tempt it to strike at a relatively slow-sinking fly were less risky than heavily weighting flies (which causes them to sink dangerously close to snags). Clearly, both of these solutions result in high levels of presentational skill becoming absolutely imperative. To us, this is a very attractive proposition; are our angling skills good enough with a restricted set of fly patterns to compare to someone fishing for their life? Back to those partially disputed “original records” dates. 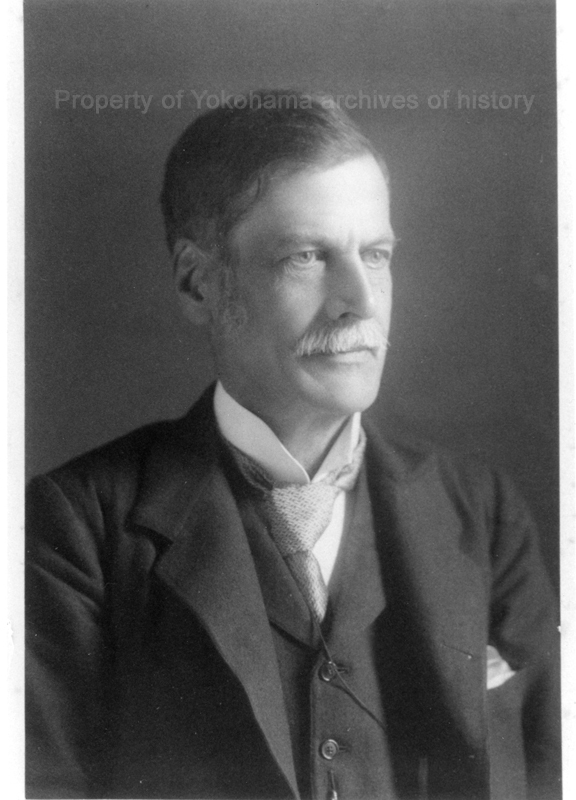 In 1877 George Elliott Gregory made observations of fly fishing on high gradient mountain streams for the Asiatic Society of Japan. 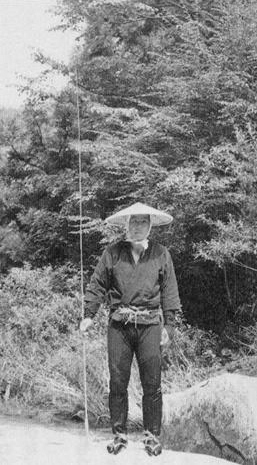 He described a simple bamboo rod and explained that “the line is used with a float but without any sink and the bait as the name ka implies, is an artificial fly” (this citation is taken from the book “Tenkara: Radically Simple, Ultra light Fly Fishing” by Kevin C. Kelleher and Misako Ishimura). If we are to split hairs, the mention of using a float does place this activity into a fairly specialised branch of the related fixed-line “ancestral” forms of tenkara and related techniques. It is, for example, not something that would be considered as tenkara in its modern incarnation. 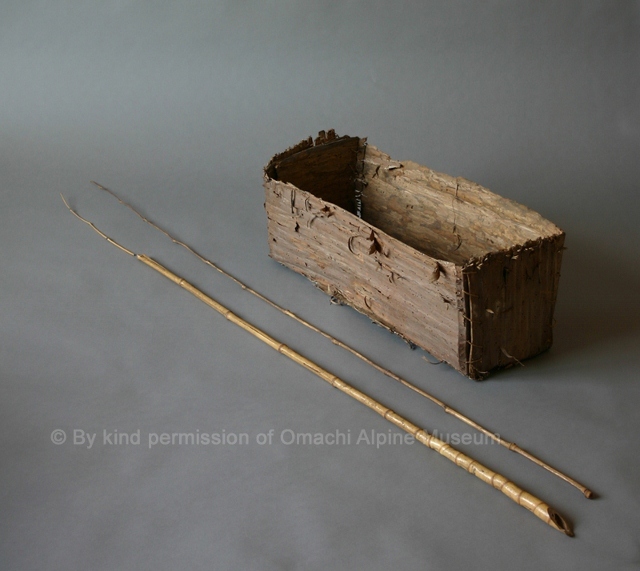 Of course, this involves a great deal of speculation, but taken together, each of these diary entries – along with the Omachi Alpine Museum’s possession of the very rod belonging to Shinaemon Toyama - do argue for these being the first records of what subsequently became adopted as a sporting pastime and named “tenkara”. It is also certain that these techniques would not have been patiently waiting for a visiting foreign diplomat before being invented! They were just part of the normal traditional fabric of life in the mountains. On the subject of the name given to this branch of fly fishing - the very fact that tenkara is written in Japanese using the “katakana” syllabary adds another mysterious angle to any historical account of its origins. Katakana is reserved for either foreign words or those words loaned from another language that subsequently become incorporated into Japanese. 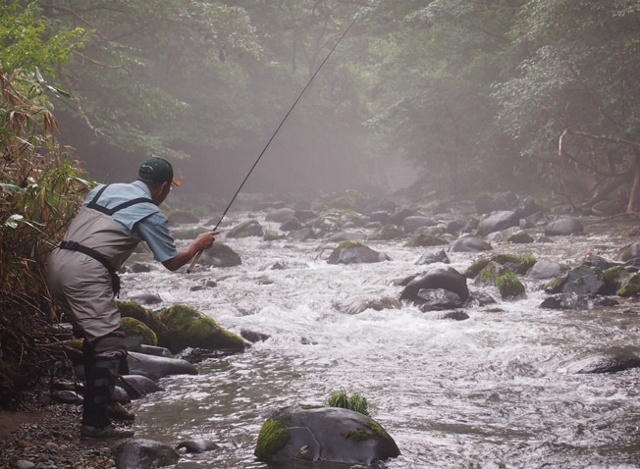 This is likely to mean that tenkara is a modern word that has been retrospectively applied to distinguish particular techniques from other “kebari tsuri” (fly fishing) disciplines. The most commonly suggested meaning is the literal translation of Ten (heaven or sky) kara (from) as a description of the artificial fly landing delicately onto the water. However there are a number of other interpretations that include, for example, a suggested derivation from the child’s hopping game “Chingara” as a reflection of the jumping between boulders undertaken by anglers in fast streams. Our favourite story (whether true or just fanciful) is that it arose from a misunderstanding when someone asked a tenkara angler what the name of their fishing style was. The story has it that the angler mistook the question to mean “how are you presenting your fly?” – and gave the highly descriptive answer “from the sky”. “Tiffined seated on a ledge of a pilgrim lodging, warmed in door. Coolie said the fish about a foot long rained from heaven”. The coincidence is apparent when we hear that the translation of “Rained from heaven” is “Ten kara fu~tsu”. blossoming of interest means that there is a thread of continual practice of tenkara styles from the originators through to the present day. The same cannot be said for the fixed line styles of fly fishing in Britain (whether of the schools of Walton, Stewart or others), which – very sadly - “went extinct”. Perhaps the greatest personification of this bridge between tenkara’s ancient origins and the modern world was Bunpei Sonehara – the last professional tenkara fisherman on the Kurobe river (or “Kurobe-gawa”, mentioned in Ernest Satow’s diary entries above). A translation from the web page at http://hac.cside.com/afcw/culture/97/sonehapr2.htm gives some detail about his life. Born in 1915, he was an extremely successful tenkara fisherman – catching (and smoking) as many as 200 fish per day. This skill, his hard work ethic and the changing world of the 20th century, allowed him to earn a salary that was comparable to that of a “white collar” worker of the day. It seems a great shame that the building of several dams caused him to exchange his career as a professional angler for that of a construction site worker. We are fortunate to have permission to use some photographs of Bunpei Sonehara’s flies & leaders (as well as other historical artifacts) on our site discovertenkara.co.uk. So what does this weight of history mean for the modern practice of tenkara? Certainly the recognised “masters” of the art are very much aware of its traditions, humble subsistence origins and isolated geographic centres of development. At the same time, they are also passionate advocates of the contemporary incarnation(s) of tenkara. Make no mistake, level fluorocarbon lines and graphite rods are space age additions to the heritage – but the manner of their use is highly codified and rooted in deep tradition. This, then, seems to be the perfect jumping off point ahead of our future investigations and articles focussing on the techniques – historic and modern – that fall under the umbrella of tenkara through the ages.